Brightline is being called a “luxury rail service” by an analyst, as the company prepares to sell $600 million worth of tax-free bonds. 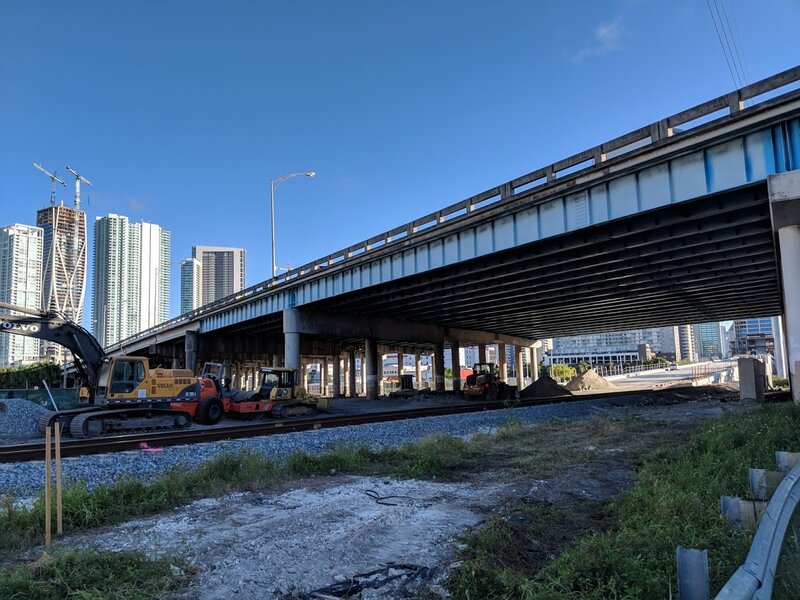 Analyst Fitch Ratings thinks that the innovative Miami to West Palm Beach service will work even if it falls short of projections and gave the bonds a BB- rating. The proceeds will only be used to finance construction of the Miami-West Palm Beach line (the Orlando line will be financed separately). Construction is “substantially complete.” Launch of the Fort Lauderale to West Palm Beach line is forecast for December 2017. Service to Miami starts in the first quarter of 2018, with $74 million worth of upgrades remaining to be completed (to be financed with equity). Miami to West Palm Beach will take 65 minutes – about the same as a car trip when there isn’t any traffic, but a significant savings in time during congested hours. Initially, one train will operate each hour, for a total of 16 round trips daily. Extra trains can be easily added if needed. Brightline is forecasting 2.9 million annual trips by 2020, or 7,945 trips per day. Currently, there are 365 million direct trips between the three cities on the line, mostly by car. The company hopes to capture a 0.74% market share. Fitch think there will be enough revenue to break even if they only get 1.624 million riders (4,449 per day), or 56% of their forecast. Passengers are forecast by Brightline to spend an average $3.58 on food and beverages in the stations or on the train. Parking spaces are forecast to generate an average of $16.53 per day. Profit projections don’t include real estate. The massive MiamiCentral residential, retail, hotel and office complex is being financed separately and not included in forecasts. The same goes for other stations. Fitch notes that Miami is now the fourth most populous urbanized area in the U.S. (behind New York City, Los Angeles and Chicago). The area is viewed by Fitch as being economically strong and diverse, with strong demographic characteristics. Miami is enjoying steady population and employment growth and robust per capita income, but remains an auto dominant area. Does Tri rail run every hour? I’m asking because I have never taken it. No, and you’ll spend 2.5 hours getting from WPB to MIA. Suggest to download Tri Rail PDF schedule, from Mia to WPB is 1:50 hrs, and train run every 30 min to 1 hour! Don’t be too smart anonimous, and don’t fool people with wrong answer! Take a look at BrightLines fare. I think i would rather ride Tri Rail for 2.5 hours at $7.00. Yes and twenty minutes during rush hour. – Limited amenities. No food, for example. There are bathrooms but they’re usually pretty filthy. What you are only makes sense if you like two waste two extra hours of your day riding in a train. The article says the $37 figure is a blend of coach and business class fares, so coach fare will be somewhat less. But if you’re going with three other people, driving will win hands down. Will be interesting to see the charges to Orlando when that service starts. Is the 37.00 one way or round trip? If one way, it’s no way. Way to expensive. 74.00 round trip plus parking nearly 100.00, insane. Yeah even if it fails its still a win for us since trirail could use the stations. The bright line was intended to be used by people who hate the suburban Mentality many still are trying to impose in South Florida. In Downtown Ft Lauderdale alone there are thousands of new rental units already built and under construction in the proximity of the bright line station. But if they are working in Miami why not just rent there and avoid the train trip. I haven’t seen condos/apt rent for noticeably less in Ft Lauderdale. Brightline is for ” Business and Leisure ” … Tri-Rail is for commuting… don’t you get it. ???? Ok, so according to this article the average price will be about $38 bucks. That is about the same cost for a full tank of premium gas in my convertible. I have relatives in Boca Raton and I visit them about twice a month on the weekend. Leaving Brickell at 11:10 a.m. I always get there by lunch at noon. To and from, eats up about 1/4 tank of gas, meaning that I can see my relatives 4 times in a two month period for the same price as one ticket on Brightline… hmmm, I just don’t see me doing that. However, I am sure a lot of other people will be able to use and afford Brightline, so I wish them much success! You have a convertable and live on Brickell. Do you wear pink polos with the collar turned up, too? There is no stop in Boca. It would be utterly impractical for you to take Brightline. In spite of your external display of income, you are not their target audience. $37.00 fare for the Bright Line then how much to park? No thanks, I’ll take the Tri Rail. $7.00 fare + free parking. Let’s not forget more stations. I think Bright Line will flop. Marge vs. the Monorail” is the twelfth episode of Season 4. After collecting a $3 million fine from Mr. Burns (for illegal disposal of nuclear waste), Springfield holds a town meeting to choose what to do with the money. Marge suggests they use it to fix Main Street, but a smooth-talking stranger named Lyle Lanley convinces the townspeople into spending the money on a needless monorail… which is built from shoddy materials. However, his slick salesmanship doesn’t win over Lisa and Marge, whom both suspect he is a con artist. I’m reminded of that episode every time some lamebrain wants to see Metromover impractically expanded. No public money went to the Brightline, though. Great Simpsons episode. let’s not forget travel time to the station including getting there ‘how long before departure’, parking, etc. I’ll just take my car, thank you. Agreed. But, for someone who works or lives in Palm Beach and needs to go to Miami for for work and vice-versa. 65-mins on a train can be productive. Sometimes I need to go to Court in West Palm Beach. That would mean 70-mins in car, for lets say 20-mins in court and then closer to 80-90mins in my car again. Meanwhile if I take the train, I can get work done on the train and that 140mins in my car is not just wasted time. Its also much more relaxing to be on a train than driving your car. If the trains leave every 30-mins it could make it possible to live in Palm Beach and work in Downtown Miami or the other way around. You can sleep on the train, read, catch up on emails etc.. If you get 2 additional hours of work done by being on the train (there and back) vs. driving, that’s 2 hours earlier that you can get to bed that night. if instead of being in a office an hour earlier to prepare for a meeting, having a video conference, finish your homework or study for a test (if you are a student) you can do so in a train, YES you are saving lots of time. It wouldn’t be wasted time if you live close to the station and your destination is close to the station. Given there is no reliable public transit and you leave your car, you need to add either taxi/Uber (expensive) or some bus (takes forever) which will pick you from the station to your destination and this may be easy another 30-60 minutes, depending on your waiting time. if it’s really going to be $40 to ride MIA to WPB, I’m not going to do it. but, 65m is the travel time outside of rush hour, and the train is going to offer *consistent* travel time. if I’m going up to West Palm for a 6:30 dinner, I need to be ready to leave by 4:15 or 4:30 in case traffic is particularly bad. The express lanes help, but then I’m looking at paying up to $10 on top of gas and parking. For tourists, it’s a real game changer. You can stay in Fort Lauderdale and come down to Miami for an easy day trip without worrying about 95 traffic or parking. And, it’s probably going to be cheaper than Ubering the whole way. All of the stations are in the urban cores of Miami, FTL and WPB decreasing the need for vehicles at all. LOL BB- bond rating “Non-Investment Grade Speculative”….fancy talk for Junk Bonds. I’d rather drive my sports car to WPB apexing the exit ramp and rev matching shifts than sit on some lame train wedged in between stinky strangers watching dog poop videos on their phones. And evidently, investors (people who actually put their own money on the line) agree there’s a problem with Brightline’s business model. Never going to work at those prices. Please bring on Tri-Rail’s Coastal Link. Brightline is just noise. I think the bond rating of BB-, junk debt, agrees with your sentiment. Cheers. Brightline = Way more Comfortable and twice as fast, almost ready to start service. Tri-Rail Coastal= Nobody knows yet if if will happen or not; if so, it probably will to have to pay to use the brightline tracks. Car dependent infrastructure = the “freedom” to be required to spend tens of thousands of dollars to buy a car, tens of thousands more to fuel, maintain, and insure it, and tens of thousands more in taxes to support the infrastructure it requires. That isn’t freedom, that’s tyranny. Real freedom is the choice to use a car or some other mode of transportation. One Car per household= Week ends Freedom.